Just as we were preparing to leave on our trip a few weeks ago, Dave started to get the sniffles. By the time we landed in the Czech Republic, he had a full-blown head cold, and a few days later, I was taken out by germs, too. The weather in Prague was rainy and cool — perfect for my black leather jacket and a bowl of fortifying Czech Garlic Soup (in Czech: česnečka) at the pub around the corner from our apartment. It’s advertised on the menu as a hangover cure, and I may have used it to serve that purpose at least once… ahem. After our grocery shopping trip to Tesco, I cooked up a bunch of meals in our apartment, including a big pot of homemade garlic soup for us to sip on to help knock out our colds. Traditionally, this soup includes cubes of white potato and fried rye bread croutons. It is admittedly luscious with the garlicky croutons on top — but it’s very, very delicious when prepared the paleo way as explained below, too. Don’t be put off by the amount of garlic. When garlic is boiled, it grows mellow and sweet, so the broth tastes rich and comforting, but doesn’t have a hot, garlic bite. If you’re in the U.S., you might not be experiencing blustery weather right now — and if you’re paleo, a hangover cure seems unnecessary 😉 — but this soup can be a tasty supplement to dinner and a gentle way to start the morning instead of coffee or tea, especially when you make it with homemade bone broth. To make it heartier, you can also add cubes of cooked beef or pork, or some browned ground meat; just add the meat during the simmer. You might also add cubes of cooked white potato. Prepare the garlic. Mince the garlic with a garlic press, knife, or mortar and pestle, then mash the garlic together with the salt to make a paste. Place the garlic/salt in a large pot and add the marjoram, caraway, and black pepper. 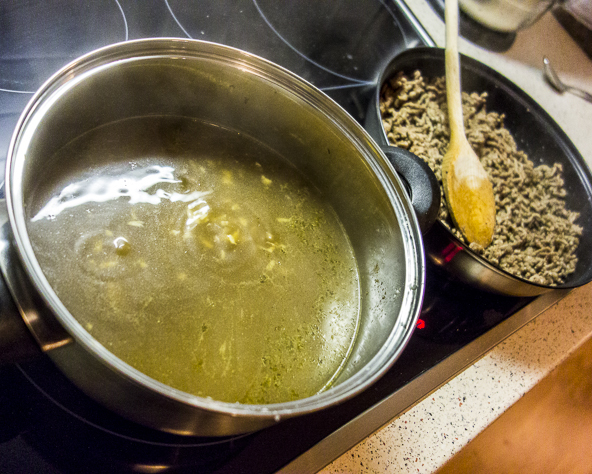 Stir with a wooden spoon to combine, then pour in the broth. Bring to a boil and simmer about 15 minutes, to allow flavors to meld. Stir in ghee, taste, and add more salt and pepper, if necessary. 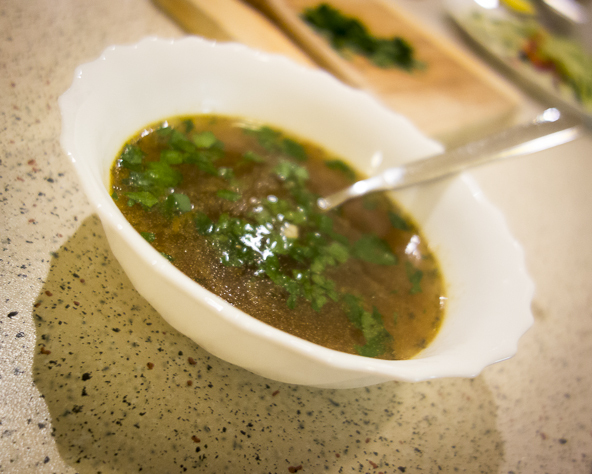 Ladle the soup into bowls and sprinkle with parsley. Slurp indulgently. Also good for keeping the vampires away! They served soup like this almost every day with lunch at my high school in Jindrihuv Hradec (just down south of Prague). I made this- just add boiled potatoes and you have the taste memories simply flooding back! Love this simple/feel-good soup. I have to admit, the recipe sounded so simple that I was a little doubtful it would turn out very well. Not to mention, I’m not the greatest cook in the world… But I just made this and it is simply delicious! My grandparents are Czech and although I’ve never had traditional Czech food, eating this česnečka makes me feel super cool. 🙂 Thanks! Oh my goodness! I lived in a small town in the Czech Republic 10 years ago, for six weeks, as an opera singer. Garlic soup was a staple for us! We would go to the local tavern on our lunch break, between rehearsals, and we’d all have to agree to have it, since we were singing in each others’ faces. It was amazing stuff, and I searched high and low for a recipe when I got back, to no avail. I had forgotten about it after all these years! I can’t wait to try this and take a walk down memory lane. Thank you for posting this recipe! How lucky you are to have lived here! I’m glad the recipe brought back fond memories. Happy cooking and eating to you! Dobry den! Thanks for stopping by to say hello. I’m LOVE Czech food, and I can’t wait until we move to Prague. Hoping it happens in 2016! I am a sucker for anything garlic, so when It was offered by a very friendly waitress in a Prague restaurant I jumped at the opportunity. And I did not regret it. But the soup was white and creamy, i.e. nothing like the pictures on this website. Would you guess that it was because they added potatoes? Hmmm… in my time in Prague, I never saw a white, creamy version. Sounds like was probably poultry broth with flour, if it was light colored and creamy. Sorry I can’t be more helpful! May be they added sour cream or wipping cream? Who cares? It was delicious. added leftover potroast meat – really awesome! This was GOOD! So quick and easy to make too. I had some leftover ground beef and pork in the freezer that needed to be used to followed your idea and browned it up and threw it into the pot during the simmer. Can’t wait to make this again, thanks! 🙂 hope you all like it! Hi! Do you know if this freezes well for saving future servings? Yes! Soups freeze great! Just defrost in the fridge and slowly reheat on the stove. I love your recipes. One question— I really dislike caraway seed , so for the recipes that use it, can you suggest a substitute? You can replace the caraway with a seed spice that you do like: cumin, coriander, fennel… or use herbs instead like fresh or dried basil or oregano. Could you make this with chicken broth? Sure. It won’t taste exactly the same, but it’s still delicious garlicky broth. Oh, so good!! Why did I wait so long to try it?? So simple and so awesome, right? !